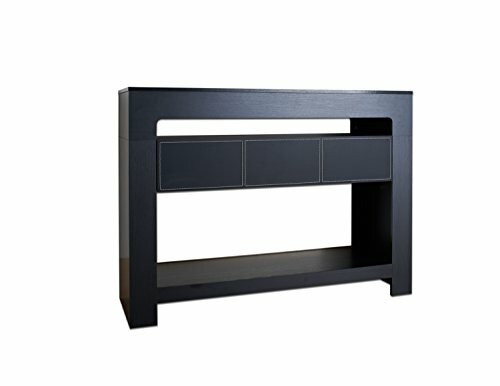 The Lado Contemporary Console Table is an attractive modern piece with great function. This table features a roomy 47 inch tabletop, a tall open shelf and a smaller open shelf for display or easy access storage. A roomy drawer on gliders has a leatherette front design and provides room for discreet storage, as well as a unique and attractive look. This console table features a simple yet bold profile, with its clean lines and bold Black finish, accented by the leatherette-front drawer. Manufactured in Taiwan. Assembly required. Overall dimensions: 47.24 Inch wide by 15.75 Inch deep by 34.84 Inch high. Accessories and decor not included.